Barefoot shoes for running are starting to show up here on the Florida beaches. 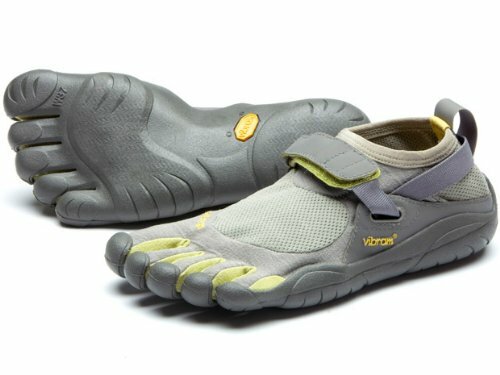 The Vibram FiveFingers KSO are the #1 player in this area of home fitness and exercise equipment. I have to admit, these things looked real weird when I first saw them, but a buddy let me try them out. It was a whole different feeling completely. To me, they are much better than bare feet for beach running because you do not have to worry about stepping on a bottle cap, sharp shell, or worse...a fish hook. I happened to kick a large, crusty bivalve Pen Shell, and it was no big deal. That surprised me. These barefoot shoes for running on the beach became big smoke after guys read about them in Mark Sisson's outstanding book, Primal Blueprint. In these barefoot shoes for running, your feet are literally hugged by the Kangaroo-skin uppers. It's comfortable with no shifting. The soles are made of Vibram TC-1 performance rubber for cushioning. I've only used these on the beach, but guys who use them on asphalt say they are just as comfortable. Maybe. I have no experience with that. One thing to keep in mind when you purchase the Vibram FiveFingers KSO barefoot shoes for running ...start out slowly. Do NOT run your usual 5 miles in these the first few times. Cut that down to 1-1/2 to 2 miles and slow your pace so the little muscles/connective tissue in your feet and ankles can adjust progressively. If you live near a beach (or run on a soft forest trail) these barefoot shoes for running might be a great addition to your home fitness and exercise equipment.